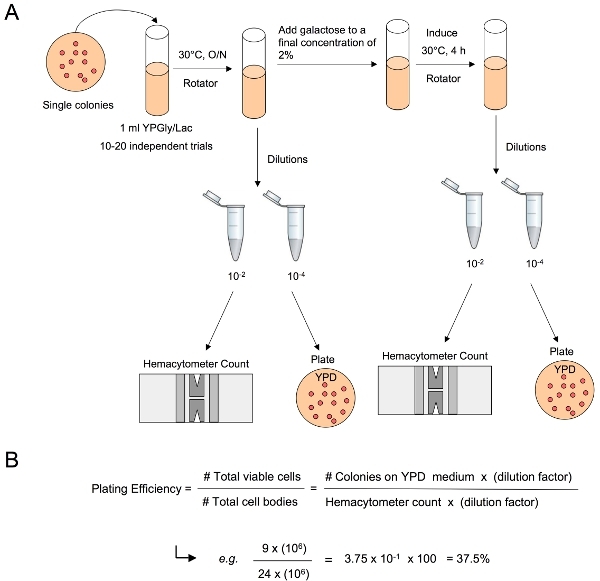 The HO-stimulated translocation assay monitors single-strand annealing following the creation of DNA double-strand breaks at multiple loci in diploid Saccharomyces cerevisiae. This mechanism may model genome rearrangements in somatic cells of higher eukaryotes following exposure to high doses of ionizing radiation. Liddell, L., Manthey, G., Pannunzio, N., Bailis, A. Quantitation and Analysis of the Formation of HO-Endonuclease Stimulated Chromosomal Translocations by Single-Strand Annealing in Saccharomyces cerevisiae. J. Vis. Exp. (55), e3150, doi:10.3791/3150 (2011). Genetic variation is frequently mediated by genomic rearrangements that arise through interaction between dispersed repetitive elements present in every eukaryotic genome. This process is an important mechanism for generating diversity between and within organisms1-3. The human genome consists of approximately 40% repetitive sequence of retrotransposon origin, including a variety of LINEs and SINEs4. Exchange events between these repetitive elements can lead to genome rearrangements, including translocations, that can disrupt gene dosage and expression that can result in autoimmune and cardiovascular diseases5, as well as cancer in humans6-9. Exchange between repetitive elements occurs in a variety of ways. Exchange between sequences that share perfect (or near-perfect) homology occurs by a process called homologous recombination (HR). By contrast, non-homologous end joining (NHEJ) uses little-or-no sequence homology for exchange10,11. The primary purpose of HR, in mitotic cells, is to repair double-strand breaks (DSBs) generated endogenously by aberrant DNA replication and oxidative lesions, or by exposure to ionizing radiation (IR), and other exogenous DNA damaging agents. In the assay described here, DSBs are simultaneously created bordering recombination substrates at two different chromosomal loci in diploid cells by a galactose-inducible HO-endonuclease (Figure 1). The repair of the broken chromosomes generates chromosomal translocations by single strand annealing (SSA), a process where homologous sequences adjacent to the chromosome ends are covalently joined subsequent to annealing. One of the substrates, his3-Δ3', contains a 3' truncated HIS3 allele and is located on one copy of chromosome XV at the native HIS3 locus. The second substrate, his3-Δ5', is located at the LEU2 locus on one copy of chromosome III, and contains a 5' truncated HIS3 allele. Both substrates are flanked by a HO endonuclease recognition site that can be targeted for incision by HO-endonuclease. HO endonuclease recognition sites native to the MAT locus, on both copies of chromosome III, have been deleted in all strains. This prevents interaction between the recombination substrates and other broken chromosome ends from interfering in the assay. The KAN-MX-marked galactose-inducible HO endonuclease expression cassette is inserted at the TRP1 locus on chromosome IV. The substrates share 311 bp or 60 bp of the HIS3 coding sequence that can be used by the HR machinery for repair by SSA. Cells that use these substrates to repair broken chromosomes by HR form an intact HIS3 allele and a tXV::III chromosomal translocation that can be selected for by the ability to grow on medium lacking histidine (Figure 2A). Translocation frequency by HR is calculated by dividing the number of histidine prototrophic colonies that arise on selective medium by the total number of viable cells that arise after plating appropriate dilutions onto non-selective medium (Figure 2B). A variety of DNA repair mutants have been used to study the genetic control of translocation formation by SSA using this system12-14. Inoculate 10-20 independent 1 ml cultures of YPGly/Lac medium (1% yeast extract, 2% peptone, 3% glycerol and 3% lactate) with single colonies of the desired genotype. Incubate the cultures overnight, or for sufficient time to reach a cell density of approximately 5x107-1x108 cell/ml, at 30°C on a rotator, or with gentle agitation. 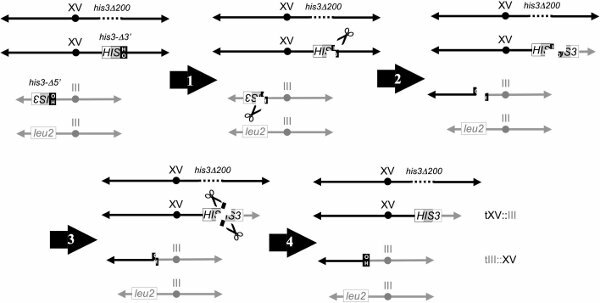 Add galactose to the cultures to a final concentration of 2% to induce HO endonuclease-directed DSBs at the his3-Δ3' (chromosome III) and his3-Δ5' (chromosome XV) translocation substrates. Incubate for 4 h at 30°C on a rotator, or with gentle agitation. After 4 h, plate appropriate dilutions of the cultures onto YPD (1% yeast extract, 2% peptone, 2% dextrose) to yield approximately 100 to 200 colonies per plate, and a sufficient number of cells onto medium lacking histidine to yield an observable number of His+ recombinant colonies. Incubate plates at 30°C for two to three days. NOTE: Step 1.4 describes the determination of translocation frequencies under selective conditions by plating the cultures onto medium lacking histidine. This assay can also be conducted under non-selective conditions by plating cultures onto YPD, and then replica-plating the colonies that arise onto –His plates two to three days later. These methods produce similar frequencies of translocation (Figure 2C). Determine the translocation frequency by dividing the number of histidine prototrophic colonies by the total number of viable cells plated (determined by plating dilutions on YPD). Determine the median translocation frequency and 95% confidence interval15. Remove an aliquot of cells from each overnight culture, and determine cell number by hemacytometer count (Baxter Healthcare Corporation. Catolog #: B3178-1). Plate approximately 100 to 200 cells using an appropriate dilution onto YPD. Incubate for two to three days at 30°C (e.g. For a culture with a cell density of 1x108 cells/ml, one should plate 100-200 μl of a 10-5 dilution per plate). Add 20% galactose to the cultures to a final concentration of 2%. After 4 h, remove an aliquot of cells from each culture, determine cell number by hemacytometer count, and plate approximately 100 to 200 cells using an appropriate dilution onto YPD. Incubate for two to three days at 30°C. Determine the plating efficiency by dividing the number of colonies appearing on YPD by the number of cells plated, and multiplying this quotient by 100. Determine the median percentage with a 95% confidence interval. Select a single His+ recombinant colony from each independent trial and prepare genomic DNA16. Digest approximately 4 μg of DNA with BamHI restriction endonuclease. Separate BamHI digested fragments on a 0.7% agarose gel, and transfer to a positively-charged nylon membrane (Hybond N+, GE Healthcare. Product Code: RPN303B)17. Hybridize with a 32P-labeled probe obtained by random priming (Amersham Biosciences. Product Code: RPN1604) with a 1.8 kb BamHI/BamHI genomic clone containing the HIS3 gene. Visualize DNA fragments by autoradiography or phosphorimaging. Grow a liquid culture of the His+ candidate tXV::III chromosome-containing recombinant in 5 ml of YPD to approximately 1-2 x 108 cell/ml. Spin down and wash the cells 2 times with 50 mM EDTA. Resuspend cells in approximately 200 μl of 50 mM EDTA, and warm to 50°C. Add an equal volume of molten 2% (w/v) low melt agarose brought to 50°C, mix thoroughly. Dispense approximately 80 μl aliquots into plug molds, and allow them to cool for 30 min at 4°C. Extrude plugs from the mold into a 12-well dish. Up to five plugs can be placed into each well. Add 3 ml of freshly prepared spheroplasting solution (14 mM 2-β-mercaptoethanol, 20 mM EDTA, 0.5 mg/ml Zymolyase 20T, 10 mM Tris-HCl, pH 7.5, 1 M Sorbitol) to each well. Incubate at 37°C for 4 hours with gentle agitation. Remove spheroplasting solution and replace with 3 ml of LDS solution (10 mM Tris-HCl, pH 8.0, 100 mM EDTA, 1% (w/v) Lithium Dodecyl Sulfate, adjust pH to 8.0). Incubate at 37°C for 15 min with gentle agitation. Remove LDS solution and replace with another 3 ml aliquot of LDS. Incubate at 37°C overnight with gentle agitation. Remove LDS and replace with 3 ml of 0.2 X NDS (0.6 g Tris Base, 93 g Disodium EDTA Dihydrate, 5 g N-Lauroyl Sarcosine, adjust pH to 8.0, brought to 500 ml with dH2O). Incubate at room temperature for 30 min with gentle agitation. Remove NDS, and repeat 2 times. Remove NDS and replace with 3 ml TE. Wash with gentle agitation for 30 min at room temperature. Repeat 4 times. Store plugs at 4°C in 2 ml of TE. Plugs can keep for up to a year. Separate chromosomes on a 1% agarose gel using a Bio-Rad CHEF-DRII apparatus at 14°C (Catalog #: 170-3612). Parameters: 1st Block: 70s switch time, 15h at 6V/cm. Visualize chromosomes by staining with 1μg/ml ethidium bromide for 30 min, irradiating with 60 mJ of UV in a UV Stratalinker (Stratagene), and de-staining for 30 min in dH2O. Irradiating ethidium bromide stained chromosomes nicks the DNA to allow for efficient transfer to the membrane. Transfer chromosomes to a positively charged membrane (Hybond N+, GE Healthcare. Product Code: RPN303B) by capillary action in denaturing conditions (0.4N NaOH, 1.5M NaCl). Hybridize with a 32P-labeled probe obtained by random priming (Amersham Biosciences. Product Code: RPN1604) with a 1.8 kb BamHI/BamHI genomic clone containing the HIS3 gene17. Visualize chromosomes by autoradiography or phosphorimaging. A graphical representation of the translocation assay is depicted at the chromosomal level (Figure 1). A schematic of the experimental procedure is also displayed (Figure 2A). Both pre- and post-induction plating efficiencies are determined by dividing the total number of viable, colony forming cells by the total number of cell bodies in the culture determined by hemacytometer count (Figure 4B). 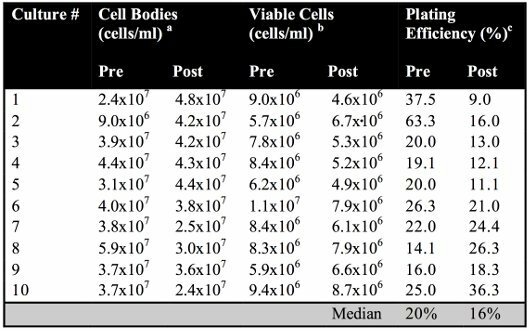 Pre- and post-induction plating efficiencies were not significantly different for wild-type cells (p-value= 0.1400) (Table 1). Table 1. Pre- and post-induction plating efficiencies in wild-type cells. a The number of cell bodies per milliliter are determined by hemacytometer count. b The number of viable cells per milliliter are determined by plating appropriate dilutions onto non-selective medium to produce ˜100-200 colonies. cThe pre- and post-induction plating efficiencies are determined by dividing the total number of viable, colony forming, cells by the total number of cell bodies in the culture, determined by hemacytometer count. This suggests that the presence or absence of either translocation chromosome does not affect the ability to survive DSB formation. The frequency of chromosomal translocations can be calculated by dividing the number of histidine prototrophic colonies by the total number of viable cells determined by plating onto YPD (Figure 2B). This assay can be conducted using strains of different genotype to identify how loss of protein function affects SSA (i.e. rad51Δ-/-). Recombination frequencies determined in different strains can then be graphed to compare differences in the ability of these strains to repair the HO-endonuclease induced DSBs by SSA (Figure 2C). Translocation frequencies obtained with the wild-type diploid strain under selective (2.2x10-2) and non-selective (2.17x10-2) conditions were not statistically different from each other (p-value= 0.9131), while the translocation frequencies obtained selectively (6.0x10-2) and non-selectively (11.9x10-2) with the rad51Δ-/- homozygote were similar but statistically different (p-value= 0.0089). The frequencies obtained both selectively (p-value=0.0001) and non-selectively (p-value=0.0002) with the rad51°-/- homozygote were statistically different from those obtained using the corresponding conditions with the wild-type strain. Putative translocation-bearing clones can be further examined by genomic Southern blot and chromosomal blot analyses (Figure 3). For Southern analysis, genomic DNA is digested with BamHI endonuclease prior to agarose gel electrophoresis, blotting and hybridization to a 32P-labeled 1.8kb HIS3 probe to visualize the diagnostic 0.8 kb his3Δ200, 1.7 kb his3-Δ3', 4 kb tIII::XV, 5 kb tXV::III, and 8 kb his3-Δ5' fragments (Figure 3B.1). Intact chromosomes can be prepared, separated by CHEF (Figure 3B.2), blotted to nylon and hybridized with the 32P-labeled 1.8 kb HIS3 probe to visualize the 1.1 Mb intact chromosome XV, 0.8 Mb tXV:III translocation chromosome, 0.6 Mb tIII:XV translocation chromosome, and 0.3 Mb intact chromosome III (Figure 3B.3). A graphical map depicting expected BamHI endonuclease-digested genomic DNA fragments, and parent and recombinant chromosomes, is depicted (Figure 3A). Figure 1. Formation of translocation chromosomes by single-strand annealing (SSA). 1) DSBs are created at the his3-Δ3' and his3-Δ5' substrates (chromosomes XV and III, respectively) by HO endonuclease following the addition of galactose to the cultures. 2) DSBs are processed to generate 3' single-strands at the ends of the broken chromosomes. 3) SSA machinery anneals complementary 311 or 60 nucleotide single-stranded HIS3 sequences formed at each of the recombination substrates. Non-homologous tails formed upon annealing are removed by endonuclease digestion. Complementary four bp overhangs on the remaining chromosomal fragments formed by HO-endonuclease digestion may also anneal. 4) Ligation concludes the creation of an intact HIS3 gene and tXV::III translocation chromosome by SSA. Cells carrying this chromosome can be selected for by their ability to grow on medium lacking histidine. Ligation may also generate the reciprocal tIII::XV translocation chromosome by a NHEJ-like mechanism. Figure 2. Assay for determining the frequency of translocation by SSA. A) One ml YPGly/Lac cultures are inoculated with single colonies of cells of a select genotype and grown to an appropriate density of approximately 5x107-1x108 cell/ml. Galactose is added to a final concentration of 2% to create DSBs at the recombination substrates on chromosomes III and XV. To conduct the assay under selective conditions, appropriate dilutions are made such that approximately 100 to 200 cells are plated onto YPD and a sufficient number of cells are plated onto medium lacking histidine to yield an observable number of His+ recombinant colonies. To conduct the assay without selection, approximately 100 to 200 cells are plated onto YPD, grown for two to three days to single colonies and then replica plated onto medium lacking histidine. B) Translocation frequency can be determined by dividing the number of colonies that grow on –His plates by the fraction that grow on YPD. C) The translocation frequencies of strains of different genotype (i.e. Wild-type and rad51Δ-/-) can be graphed to compare differences in the ability of these strains to repair the DSBs by SSA. Figure 3. Determining plating efficiency. (A) An aliquot of cells is taken from the overnight culture prior to and post DSB induction, appropriate dilutions are made, followed by a hemacytometer count to determine the total number of cell bodies per ml of culture. Appropriate dilutions are plated onto non-selective medium to determine the total number of viable cells per ml, by counting the colonies that appear on YPD. (B) The plating efficiency is then determined by dividing the total number of viable cells by the total number of cell bodies, and multiplying this quotient by 100. Figure 4. Detection of chromosomal translocation events by genomic Southern blot and chromosome blot analyses. A) Graphical representation of relevant chromosomes before (left) and after (right) translocation formation. Sizes of parent and recombinant chromosomes are listed in megabase-pairs (Mb). Sizes of restriction fragments containing relevant sequences generated by BamHI digestion of genomic DNA from parent and recombinant strains, and revealed on blots by hybridization with a 1.8 kb BamHI HIS3 genomic clone, are listed in kilobase-pairs (kb). Chromosomes are not drawn to scale. B) Physical analysis of putative translocation-bearing clones. (1) Genomic Southern blot analysis – Genomic DNA was collected and digested with BamHI restriction endonuclease, fractionated by gel electrophoresis, blotted to nylon, and hybridized to a 32P-labeled 1.8 kb HIS3 probe to visualize the following fragments: 0.8 kb his3Δ200, 1.7 kb his3-Δ3', 4 kb tIII::XV, 5 kb tXV::III , and 8 kb his3-Δ5'. Lanes: a) parent diploid, b) His+ non-reciprocal translocation recombinant, c) His+ reciprocal translocation recombinant. (2) CHEF gels - Intact chromosomes were prepared in agarose plugs, separated by CHEF, stained with ethidium bromide and visualized under UV light. Lanes: As above. (3) Chromosome blots – Separated chromosomes were blotted to nylon and hybridized with the 32P-labeled 1.8 kb HIS3 probe to visualize the following chromosomes: 1.1 Mb intact chromosome XV, 0.8 Mb tXV:III translocation chromosome, 0.6 Mb tIII:XV translocation chromosome, and 0.3 Mb intact chromosome III. Lanes: As above. High doses of ionizing radiation present an inherent risk of genome instability through the generation of a large number of DSBs19. Eukaryotic genomes are replete with repetitive sequences that are excellent substrates for generating translocations and other genomic rearrangements20,21. Chromosomal translocations by HR are frequently observed when DSBs are introduced between repetitive sequences12,21,22. Overwhelming evidence suggests that much of the genomic instability associated with leukemias and lymphomas can be attributed to chromosomal translocations, highlighting the importance of understanding how this mechanism occurs in eukaryotes22,23. We have developed a system in budding yeast for examining the formation of translocation chromosomes by DSB-induced HR between short regions of homology on different chromosomes that are similar in size to repetitive elements dispersed throughout the yeast and human genomes. In the assay, the his3-Δ3' translocation substrate is located on one copy of chromosome XV. The other his3 allele (his3-Δ200) has a ~1kb deletion of the HIS3 promoter and coding sequence that prevents this sequence from being used as a template for repair24. The his3-Δ5' substrate is located at the LEU2 locus on one copy of chromosome III, with the other copy of chromosome III containing an unaltered LEU2 allele (Figure 1). A galactose-inducible HO endonuclease expression cassette marked with KAN-MX was inserted into the TRP1 locus of chromosome IV (trp1::GAL-HO-KAN-MX). Each translocation substrate is flanked by a HO-endonuclease recognition sequence that can be targeted for cleavage by inducing expression of the HO gene through the addition of galactose to the medium. After HO-endonuclease induced cleavage at the his3-Δ3' and his3-Δ5' substrates, cells can efficiently use the shared short tract of HIS3 sequence homology (311 bp or 60 bp) to repair the broken chromosomes by HR, generating a translocation chromosome with an intact HIS3 allele12-14,25. Because the parent cells lack an intact copy of the HIS3 gene, they are unable to grow on –His medium. Only cells that have undergone the translocation event can be selected for on medium lacking histidine. Therefore, the frequency of chromosomal translocations can be calculated by dividing the number of histidine prototrophic colonies by the total number of viable cells plated, determined by plating onto YPD. Genomic DNA and intact chromosomes can then be isolated from representative His+ colonies, and the presence of a translocation chromosome verified by genomic Southern and chromosome blot analyses. Careful analysis has allowed us to gather additional important information about the assay12. Genomic Southern blot analysis has provided evidence that there is virtually complete cutting of chromosomes XV and III after 30 minutes of HO-endonuclease induction, and thus there is no significant background of uncut chromosomal substrates in the population (G. Manthey & A. Bailis, unpublished results). Genomic Southern and chromosome blot analyses of His- survivors indicates that cells frequently lose one, the other, or both cut chromosomes and remain viable (L. Liddell & A. Bailis, unpublished results). Importantly, the nearly equivalent plating efficiencies on non-selective medium before and after induction of expression of HO-endonuclease indicates that neither the failure to repair broken chromosomes, nor the failure to retain translocation chromosomes affects the ability to survive DSB formation. Consistent with this, the tXV:III translocation chromosome has been shown to be unstable in mitotic cells in the absence of selection. This was demonstrated by growing tXV::III containing His+ recombinants overnight non-selectively, plating single colonies onto non-selective plates, and replica plating onto selective medium lacking histidine. Ten to 70% of the colonies arising on these plates had lost the tXV::III translocation chromosome (N. Pannunzio & A. Bailis, unpublished results). Translocation chromosomes generated by IR exposure in humans exhibit a similar instability26. This suggests that translocation formation may contribute to early events in tumorigenesis by promoting loss of heterozygosity. Second, extensive genetic and molecular analyses suggest that SSA, an efficient and obligatorily non-conservative mechanism of HR, is the primary mechanism of translocation formation by HR following the simultaneous creation of DSBs on two chromosomes12,27,28. This is consistent with the finding that large doses of IR result in a density of DSBs sufficient to create breaks adjacent to multiple repetitive sequences in the yeast genome, and a high frequency of translocation formation by HR. Together, these observations suggest that the oncogenic effect of IR exposure in humans may, in part, result from the repair of DSBs by an efficient mechanism of HR that generates translocations that, through their inherent instability, promote genetic changes that launch tumorigenesis. Because radiation is often used to treat cancer, genome rearrangements that result from repair of radiation-induced DSBs may contribute to the generation of secondary cancers that arise frequently in patients. Thus, this model may help us gain a better understanding of the genetic and molecular basis of an important clinical response to IR treatment. This work was supported by funds from the National Institutes of Health and the Beckman Research Institute of the City of Hope. We would like to thank the reviewers for their constructive comments that added clarity to the manuscript. Sen, S. K. Human genomic deletions mediated by recombination between Alu elements. The American Journal of Human Genetics. 79, 41-53 (2006). Han, K. Alu recombination-mediated structural deletions in the chimpanzee genome. Plos Genetics. 3, 1939-1949 (2007). Zhang, F. Copy number variation in human health, disease, and evolution. Annual Review of Genomics and Human Genetics. 10, 451-481 (2009). Goodier, J. L., Kazazian, H. H. Retrotransposons revisited: The restraint and rehabilitation of parasites. Cell. 135, 23-35 (2008). Lanktree, M., Hegele, R. Copy number variation in metabolic phenotypes. Cytogenet Genome Res. 123, 169-175 (2008). Mullighan, C. Genome-wide analysis of genetic alterations in acute lymphoblastic leukaemia. Nature. 446, 758-764 (2007). Mattarucchi, E. Microhomologies and interspersed repeat elements at genomic breakpoints in chronic myeloid leukemia. Genes Chromosomes Cancer. 47, 625-632 (2008). Stenger, J. Biased distribution of inverted and direct Alus in the human genome: implications for insertion, exclusion, and genome stability. Genome Res. 11, 12-27 (2001). Hedges, D., Deininger, P. Inviting instability: Transposable elements, double-strand breaks, and the maintenance of genome integrity. Mutat Res. 616, 46-59 (2007). Symington, L. Role of RAD52 epistasis group genes in homologous recombination and double-strand break repair. Microbiol Mol Biol Rev. 66, 630-670 (2002). Lewis, L., Resnick, M. Tying up loose ends: nonhomologous end-joining in Saccharomyces cerevisiae. Mutat Res. 451, 71-89 (2000). Pannunzio, N. R., Manthey, G. M., Bailis, A. M. RAD59 is required for efficient repair of simultaneous double-strand breaks resulting in translocations in Saccharomyces cerevisiae. DNA Repair (Amst). 7, 788-800 (2008). Nicholas, R., Pannunzio, G. M. M., Bailis, A. M. RAD59 and RAD1 cooperate in translocation formation by single-strand annealing in Saccharomyces cerevisiae. Curr Genet. 56, 87-100 (2010). Manthey, G. M., Bailis, A. M. Rad51 Inhibits Translocation Formation by Non-Conservative Homologous Recombination in Saccharyomyces cerevisiae. Plos One. 5, (2010). Knight, W. Confidence Intervals for the Median: Two sided Symmetric --95 or Better. Available from: http://www.math.unb.ca/~knight/utility/MedInt95.htm (2006). 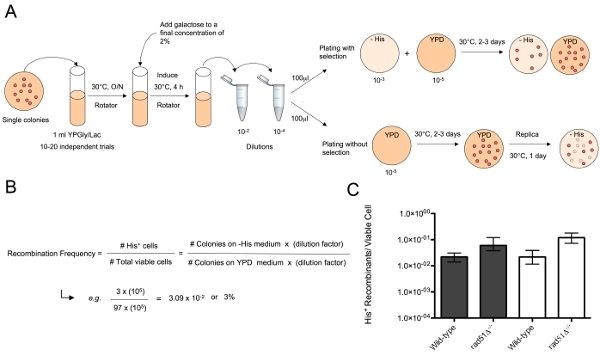 Hoffman, C. S., Winston, F. A ten-minute DNA preparation from yeast efficiently releases autonomous plasmids for transformation of Escherichia coli. Gene. 57, 267-272 (1987). Sambrook, J., MacCallum, P., Russell, D. Molecular Cloning: A Laboratory Manual. 3rd edition, Cold Spring Harbor Laboratory Press. Cold Spring Harbor, NY. (2001). Iadonato, S. P., Gnirke, A. RARE-cleavage analysis of YACs. Methods Mol. Biol. 75-85 (1999). Argueso, J. L. Double-strand breaks associated with repetitive DNA can reshape the genome. Proc. Natl. Acad. Sci. U. S. A. 11845-11850 (2008). Batzer, D. A. Alu repeats and human disease. Molecular Genetic Metabolism. 67, 183-193 (1999). Fasullo, M., Dave, P., Rothstein, R. DNA-damaging agents stimulate the formation of directed reciprocal translocations in Saccharomyces cerevisiae. Mutat. Res. 314, 121-133 (1994). Richardson, C., Jasin, M. Frequent chromosomal translocations induced by DNA double-strand breaks. Nature. 405, 697-700 (2000). Look, A. T. Genes altered by chromosomal translocations in leukemias and lymphomas. The Genetic Basis of Human Cancer. McGraw Hill. (2002). Fasullo, M. T., Davis, R. W. Direction of chromosome rearrangements in Saccharomyces cerevisiae by use of his3 recombinational substrates. Mol. Cell. Biol. 8, 4370-4380 (1988). Manthey, G. M., Naik, N., Bailis, A. M. Msh2 Blocks an Alternative Mechanism for Non-Homologous Tail Removal during Single-Strand Annealing in Saccharomyces cerevisiae. PLoS One. 4, e7488-e7488 (2009). Muller, I. Time-course of radiation-induced chromosomal aberrations in tumor patients after radiotherapy. Int. J. Radiation Oncology Biol. Phys. 63, 1214-1220 (2005). Lin, F. L., Sperle, K., Sternberg, N. Model for homologous recombination during transfer of DNA into mouse L cells: role of DNA ends in the recombination process. Mol. Cell. Biol. 4, 1020-1034 (1984). 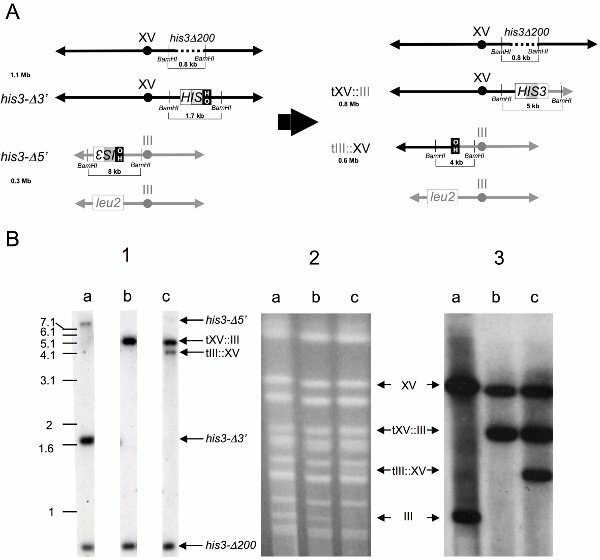 Ivanov, E. L. Genetic Requirements for the single-strand annealing pathway of double-strand break repair in Saccharyomyces cerevisiae. Genetics. 142, 693-704 (1996).